Provide information tools and communication media in the form of websites, publications, books and forums for discussions that regularly and consistently disseminate information on energy economics to the public and related stakeholders. Facilitate participatory process in the planning of energy development for a region or sector. In the next 5 years assist the development of at least 10 regional energy plans (at province/regency/ municipal level) in Indonesia. Formulation and recommendation of policies, strategy or regulatory framework that effectively and equitably support the implementation of renewable energy development and utilization nation wide. Gather information, learn and disseminate knowledge obtained from the research, studies and networks of energy institutions and practitioners. 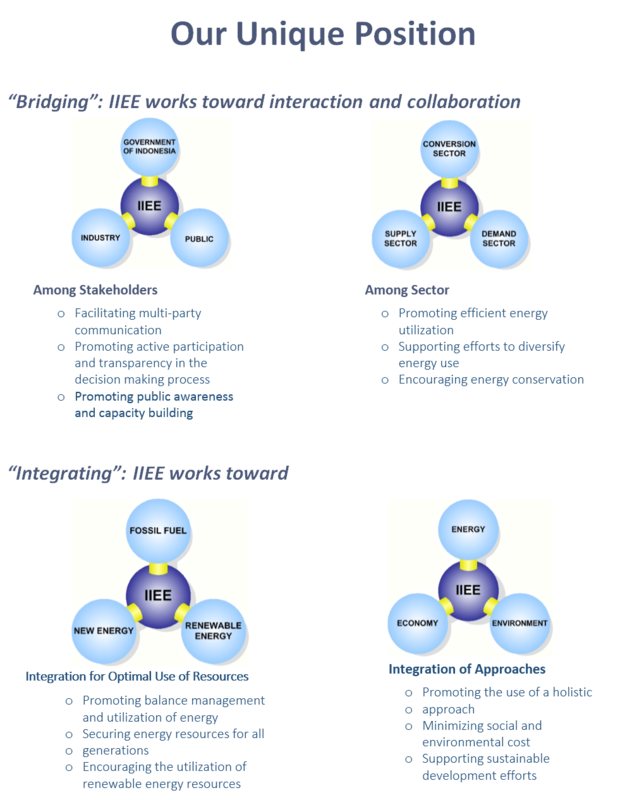 Facilitate dialogue, bridging communication and development of networks among stakeholders concerned with energy economics. Build synergy and cooperative relations with government agencies, business communities, scientific institutions, NGOs and local communities that have a stake in sustainable energy management.